It was the encounters with people in India that are more starkly etched into my heart and memory than the impressive monuments I visited. Arriving tired and in a state of nervous anticipation at Indira Gandhi International Airport in Delhi, I was much relieved to find my driver, Mr Yasvinder, patiently waiting outside gate 5 in the pre-dawn hours of the morning. He looked small and fragile, yet his driving skills and general efficiency quickly made me feel comfortable enough to nod off while we were barreling through the darkness towards the mythical beauty of the Taj Mahal. For the next three days he provided me with a safe passage through the confusing and crowded streets of Agra and Jaipur, as well as the highways of what is known as The Golden Triangle. It was with a sense of reluctance that I waved him goodbye, but other drivers full of stories and quirky approaches to traffic rules replaced him. Everywhere I visited I was met by a knowledgable guide harbouring an astonishing surplus of facts, dates and names. In order to work as a guide in India one has to go through stringent formal training that culminates in a tough examination. All the guides I encountered spoke a lucid English, interspersed with light banter, jokes, and charming tales. They displayed impeccable manners and a courteous attitude. The words “please come”, “please watch” and “be careful please”, echoed throughout the monuments we visited, and kept me from falling, bumping my head or simply losing myself in the vastness of the past. They warned against vendors selling fake goods at inflated prices, yet all had a friend selling the real thing they were eager to introduce me to. Playing along with the attitude of “no one can make me buy something I don’t want”, allowed me to amuse myself to the point of exasperation and exhaustion. It is all an essential ingredient in the true taste of India, and on all but one occasion I managed to keep my cool and smile intact. Looking for a boat ride on the lake, I bumped into Ammu whose unique way of soliciting business reminded me more of an encounter with an old friend, than a business deal. In his match-box shop I decided on a design for a henna tatoo and a head and back massage, and while we waited for the two women he called to arrive, he enthusiastically chatted away about his life before leisurely ‘reading’ my hand, hoping perhaps, but not expecting me to buy a full consultation. The fluidity of time was tangible here, and as I indulged in the pleasures of being pampered and glimpsing into the lives of the locals, I was glad to have nothing planned and nowhere to go. Indians in general are warm, welcoming and quick to reciprocate a smile. 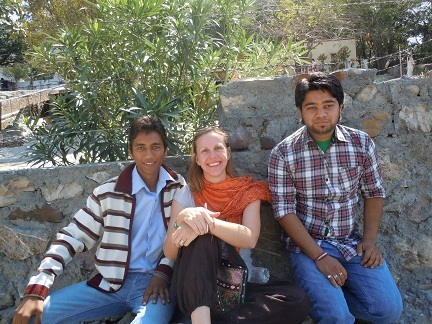 I felt a bit like a starlet with the many Indians that wanted to have their pictures taken with me. Feeling awkward at first, I managed to relax into this oddity, that I realised is also very typical, and towards the end of my trip even managed to playfully initiate a photo-taking session with a group of school boys that resulted in lots of laughter and a general sense of well-being. On one of my forays into the back lanes of Rishikesh I bumped into an elderly Baba who kindly took it upon him to teach me different ways of greeting apart from the standard “Namaste”, before joyfully insisting that I take his picture. Another time I missed out on an opportunity to get to know Raju Baba a little bit better, as I was rushing back to the ashram for a yoga class, declining an invitation for sharing a cup of tea, but leaving with a drawing reflecting an innocence and simplicity that is a reflection of life in a place where spirituality is a vital component of the oxygen one breathes here. Impulsive, yet fleeting interactions brought a sense of lightness to my journey; a distinct feeling that we are all connected and the knowledge that India is so much more than images of poverty. Its richness is to be found in its people, and not the consumerism that has corrupted the western psyche. When one allows time and space for interactions with the people of this vast space, India will never disappoint, and always touch the centre of your being.